The Freeman FATA12 1/2” Aluminum Air Impact Wrench offers the power and performance you need, whether you are a professional mechanic or a hobbyist fixing your car at home. The 1/2" square drive is ideal vehicle maintenance, restoration, and all-around use. This tool zips off rusted fasteners with ease and makes quick work of tire rotations, suspension work, and any other high-torque situation. This compact tool’s twin hammer mechanism delivers a maximum torque of 487 ft. lbs. with reduced vibration, and provides an impressive free speed of 8,000 RPM for fast, efficient performance. The one-hand forward/reverse power regulator provides 5-speeds to ensure there are never any stripped, damaged, or overtightened bolts. The front exhaust keeps the excess air away from you and keeps debris away from your work space, while the ergonomic handle provides a solid and comfortable grip. 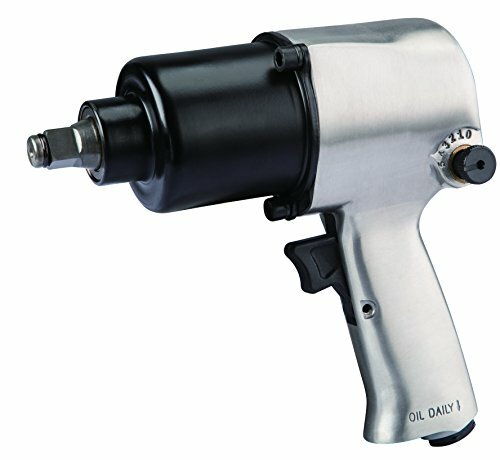 The 1/2" Aluminum Air Impact Wrench is constructed with a lightweight composite steel housing, includes a 1/4” industrial NPT, 1/4” automotive fitting, adjustment tools, air tool oil, and is covered by Freeman's 7 Year Limited Warranty and 90 Day Wearable Parts Warranty.